This post covers some of the new success with the teeny weeny telephoto lens accessory for the IPhone. We overcame the issue of getting longer exposure time and shutter release delay timer so that the IPhone is not vibrating due to pushing the camera shutter button. Before getting into that success story though we should look at one upcoming event on the calendar. So now back to the success story. Hooray! 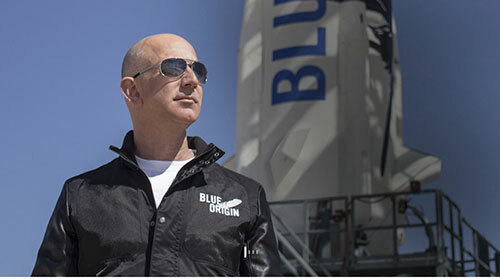 We can report on some success with the IPhone telephoto lens attachment which has been discussed in several recent posts including, March 23 and March 31. 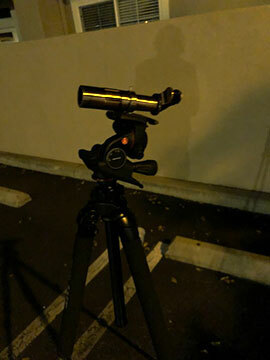 Remember from those discussions the goal of evaluating the teeny telephoto was to see if it would provide a very light weight and easy to pack for travel and convenient way to do a little more astrophotography with only your cellphone. Of course, if your plan is to do some serious astrophotography, you are going to pack your better camera, tripod, tracking mount, telescope, etc., but I often fly to some conference and don't intend to do any serious observing, but I always have my cellphone and like the idea of a light, easy to carry telephoto lens. Well, we discovered a couple of issues with this little lens and now have some comments and lessons learned. The first issue with using the IPhone with attached telephoto lens was that pushing the shutter button resulted in to much camera motion and the captured image was wobbling all over the place. The second issue was getting long enough exposure times so that dim objects, like the moons of Jupiter, could be imaged. Well those two issues were solved. Even though the IPhone camera app has a built in function to delay shutter operation, it doesn't offer much control over exposure settings. Fortunately an IPhone app called "NightCap" provides both of those needed functions. 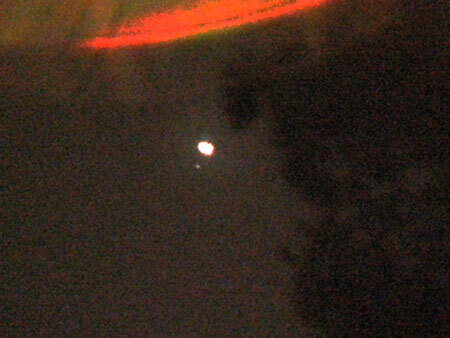 Hey, look at this photo below of Jupiter and one of its moons. Too bad my site location included some trees that probably have interfered with getting anything on any of the other moons. This image and the following image are shown full image size and have not been cropped or magnified. 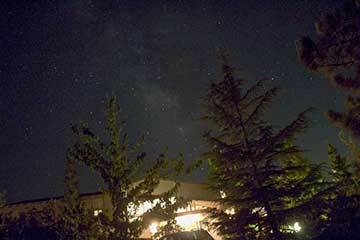 This second image was taken with the same teeny weeny telephoto accessory, but with some different NightCap settings. Unfortunately, I have no information on what the shutter exposure setting was. 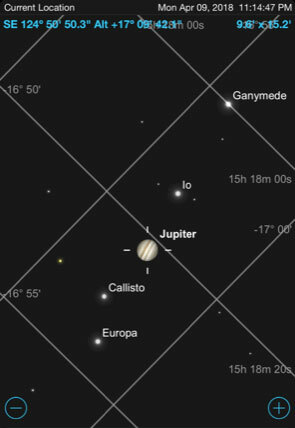 I probably should have read the instruction manual before going outside to look for Jupiter. Just in case you don't recall what the teeny weeny telephoto lens for the IPhone looks like, check out the photo below. You will notice first of all, that I have cheated and used a more sturdy tripod than the little one that came with the telephoto lens. Yes, there is a lot of background light (that's my shadow on the wall), but having a bright light nearby was really advantageous because it provided a convenient target to get the lens and IPhone all aligned prior to looking for Jupiter, which was much smaller and harder to point at. 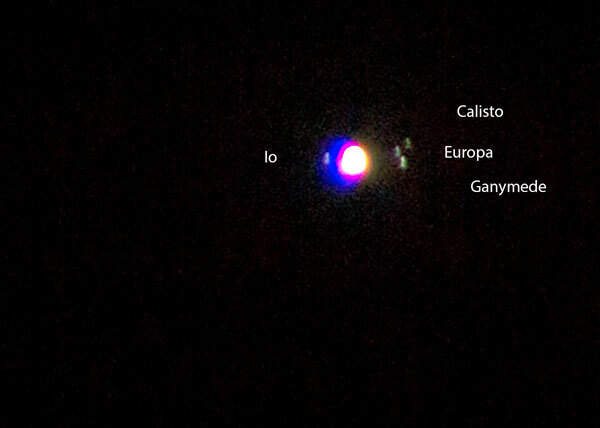 So, what do we know about what moon of Jupiter is captured in the photo. Well take a look at the Sky Safari Pro screenshot below which shows the predicted location of the moons at the time of the shot. Hmm, there are four moons in the screenshot, but the IPhone camera image only shows one moon. What is going on? 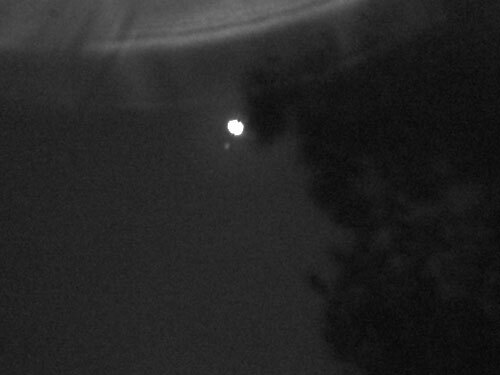 It might be that one of the moons is just a bit dim to show up enough to be recognized in the image and it might be the case that a moon or two is hidden behind the tree limbs. So, it is not clear which moon is shown in the image. Sometimes I think I can see one more moon in the image, but it is just not clear enough. So, take a look at the predicted location of the moons and tell me which moon you think is shown in the image? Ok, so that little lens seemed to work, but will it really meet the original desired goal? I think not! You need a good sturdy tripod and it does take a few minutes to get the lens and camera aligned and it is easy to bump the whole thing and have the optical axes move out of alignment. Yeah, I guess I could have tightened up the clamp that holds the lens on the IPhone, but I got a little squeamish about tightening it up any more, it is after all pressing directly on the IPhone screen and I didn't want to break my phone. Also, the lens clamp that presses on the screen, just happens to cover up some of the IPhone icons that I wanted to access. So, I think on balance, I'll retire this little lens to the used telescope equipment museum and just plan to take my heavier, bulkier, DSLR, in my travel bag. The Sky Safari Pro screenshot below shows the position of the moons at the time of observation. Notice the different orientation of the moons over just the short period of about 29 hours. We know that the orbital plane of the moons is not changing and that the observed apparent motion is really just caused by our rotating position on the Earth. 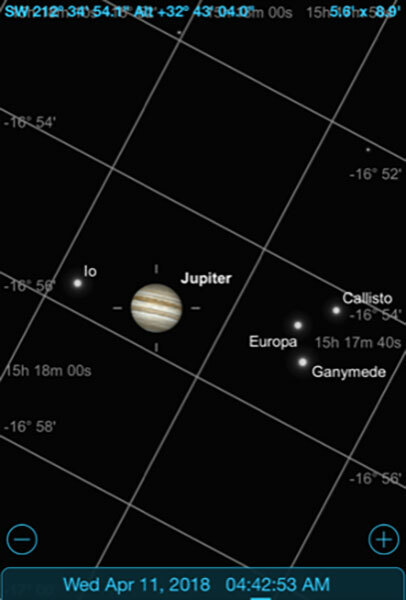 Of course, the position of the moons is really changing because they are in orbit around Jupiter. If you observe the orbital plane you see the Earth's motion makes it appear to be rotating clockwise. Place of the Palmia Observatory in which you can check the information about the real science and can share the lessons learned. Enjoy the weekly blogs here and you can rewrite my paper with the better option here in this field. The shutter can be purchased separately.